The same scientists that cloned Dolly are contemplating cloning a wooly mammoth. When scientists discovered preserved blood and muscle tissue from a frozen baby wooly mammoth, the first question that came to mind was - can this be used to clone a wooly mammoth? The answer is: Eventually. There are two potential ways to clone a wooly mammoth. The first is similar to the one used to clone Dolly, which involves transplanting a viable cell into an elephant embryo and hoping the momma elephant could carry the fetus to term. However, there are several hurdles in the way of that method. First, DNA degenerates quickly at the temperatures of melting ice and snow, where wooly mammoth remains are often found. "By the time you've got a bone sticking up in the sunshine, it's effectively too late. You need to get it straight out of the deep freeze, as it were," stem cell scientist Sir Ian Wilmut said. Further, the cloning process is highly inefficient and can require several thousand eggs. Considering the Asian elephant is in danger of becoming extinct itself, harvesting hundreds of health embryos from fertile females would be morally unconscionable. However - there is a workaround, and it involves the elephant's most loathed enemy: the mouse. Since the mechanisms that regulate ovary functions are similar across different mammals, elephant eggs could be transplanted into mice for initial insemination, and then transferred back into the elephant for gestation, and, hopefully, delivery. 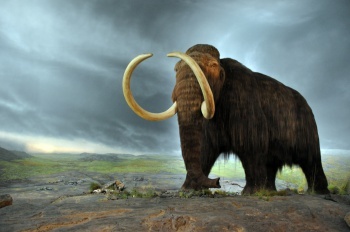 The second method involves using proteins to transition a mammoth's adult cells back into stem cells, which could then be used to grow tissues in a laboratory. Studying the wooly mammoth tissue would allow scientists to study the beast on a cellular level - it might even provide some insight as to what caused its ultimate extinction. The stem cells could also be used to create egg or sperm gametes. If the cells are female, it could provide an alternative source of eggs for research. If the cells come from a male, it could be used to fertilize a mammoth embryo, or, injected into an elephant to create a new hybrid. Elemammo? Mammaphant? Wooly elephant? I can't decide which one I like best. We probably won't be seeing a wooly mammoth clone any time soon, but with the refining of processes and procedures and perhaps a bit of luck, a Pleistocene Park might be in our future. But, even if we could clone a mammoth, should we? "Mammoths were very similar to elephants, we believe," molecular biologist, Professor Michael Hofreiter said. "In other words, they were highly social, intelligent creatures. What right have we got to recreate one or two and then keep them in solitary confinement at zoos or research facilities? I have problems with those who think this is not a real issue."